The Department of Social Development (DSD)’s NPO Directorate has received increasing numbers of requests from national welfare councils, national bodies and national networking organisations to intervene and provide strategic guidance on a range of governance issues, particularly with regard to entrenching accountability and transparency. In response to these queries, the DSD commissioned Inyathelo to conduct a study into current governance practices of national non-profit bodies and national networking organisations (the target organisations). 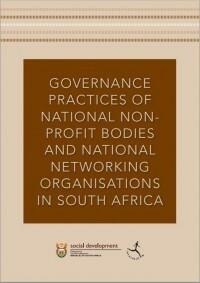 The goals of the study were to assess the extent to which these organisations are modelled distinctively in terms of organisational and governance formation and structure, and to make recommendations to the DSD on appropriate interventions that would best promote good governance practices in such organisations. This study is exploratory in nature and aims to place certain key findings and specific recommendations on the Department’s non-profit governance agenda.